Damn right. I started collecting with Tau. But most of my friends collected Orks, so if you ever got cornered you were more screwed than usual. I hear Apocalypse has some kinda good for ya. Pfff, Taus are ghey. Al Hail Slaneesh! Add to that a bunch of Broadsides, a few groups of Crisis suits, an O Shovah unit,and an Ethereal. 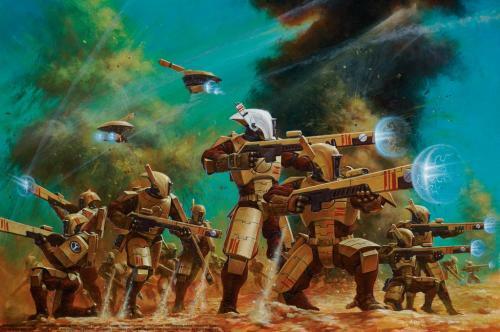 Then you have the Kroot, who are a force to be reckoned with on their own…. The Kroot will be ripping off your face and eating it while you’re disassembled at a molecular level by the sheer force of firepower. If you need to roll a dice to fire a gun you’re playing the wrong game.